A hotel with an impressive pool always seems to be a major deciding factor when I’m researching my next place to stay. In fact the minute I offload my luggage, it’s the one place I head for before dinner to slip into the relaxed pace of holiday time. A pool is never just a pool, as you will discover with these seven eye-catching places for a dip. With hotels now striving for ever better swimming pools as their centrepieces, designers are getting more creative than ever with their architecture and design, giving guests a real treat when they cool off. With hotels now striving for ever better swimming pools as their centrepieces, designers are getting more creative than ever with their architecture and design, giving guests a real treat when they cool off. They throw spectacular vistas and are places to see and be seen. These pools demand that you do more than just a few laps in them. 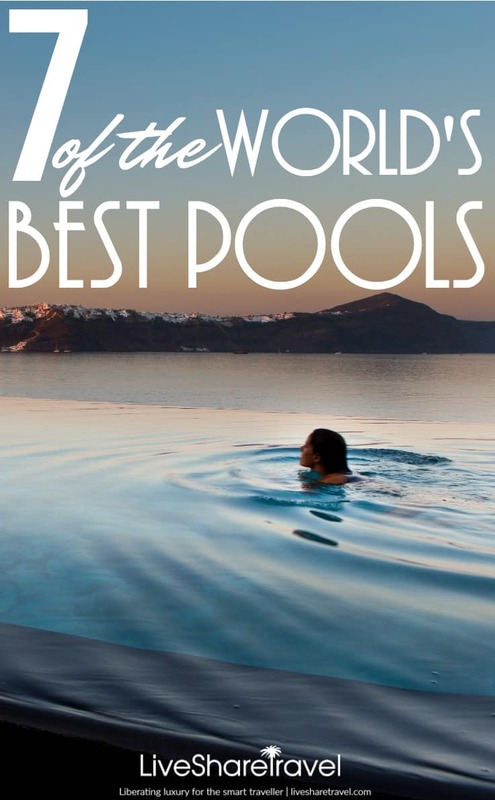 From infinity pools with sprawling urban views to dramatic mountain vistas, there is a pool view for everyone and we think you might just find one that catches your eye in this selection of the world’s best pools. So pack your swimwear and poolside essentials, and dive in at one of these seven pools. 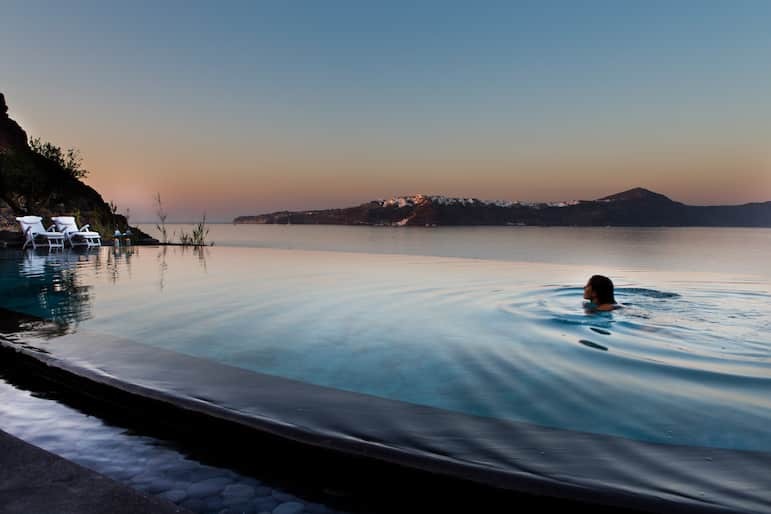 The infinity pool at Perivolas has graced many a magazine cover and for very good reason – it’s perhaps one of the best and most expansive views you could wish for from a hotel pool. Hanging above a sea of blues across Santorini’s famous ‘caldera’ the views are hypnotic and inviting. Add in the hotel’s secluded and intimate location, and it becomes the very definition of a romantic and restorative break. Another infinity pool but with an altogether different view, Marina Bay Sands is an icon of Singapore, and not just for the views face on, but the those from the rooftop of the hotel – 57 floors above the city. The world’s largest infinity pool – it’s best enjoyed with a glass of champagne as you drink in the burnt orange of a Singapore sunset. And as the lights begin to glitter in the evening, it’s easy to see why this is considered the best photo opportunity in the city. 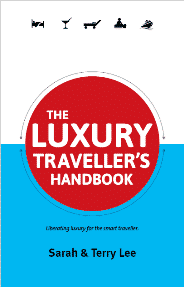 Sometimes cosy and compact feels much more luxurious than large swathes of water and views to match. Or it least that’s the case when you splash land into your own private pool. 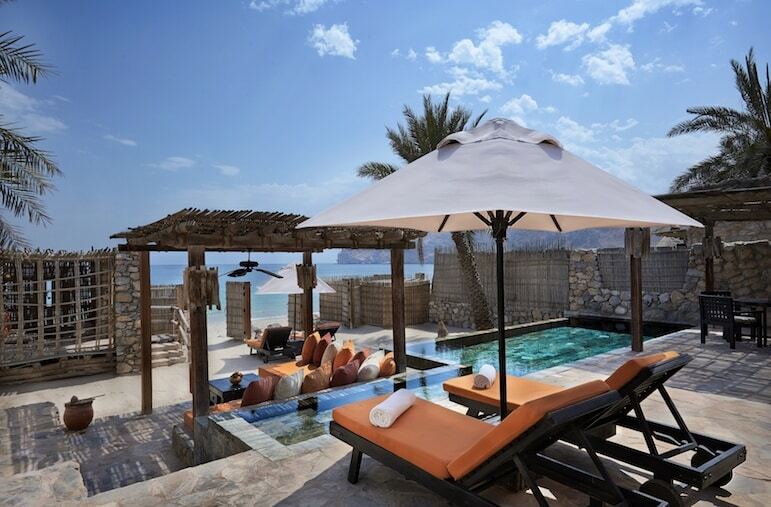 Six Senses Hideaway is a favourite because it also comes with your own section of beach, cabanas and more… and relax! We’ve addressed the length and breadth of pools, but consideration is rarely given to the depth. 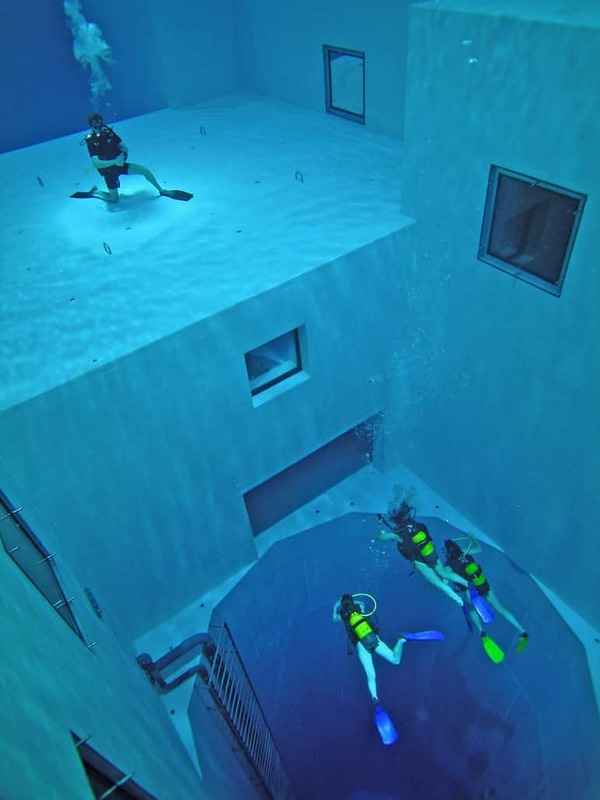 Nemo 33 is the deepest indoor pool in the world which offers a variety of scuba certifications. And you can leave the scuba suit at home, as the pool is also solar heated. It’s all in a name at the Peace Laguna Resort and we can’t get enough of these lake and mountain views overlooking the Lagoon pool. 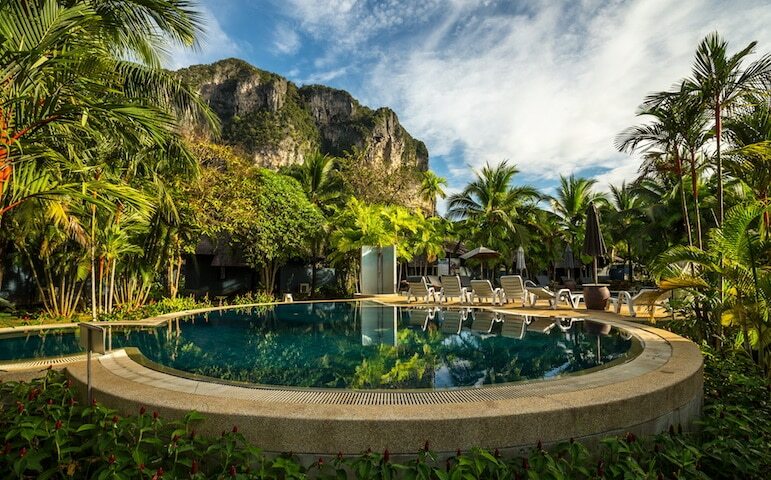 The resort in Krabi, is neatly sandwiched into the side of a dramatic limestone cliff, and with suites resting around the natural lake, it’s the picture-perfect setting for a restorative pool break after a few days exploring Bangkok. The palace-like surroundings around the pool at The Oberoi Udaivilas gives a sense of exclusivity, and the fact that one of the resort pool’s can only be accessed via the private suites adds to the grandeur of poolside living. Resting on the bank of Lake Pichola, guests are free to lie back and admire the amazing sights of Udaipur. 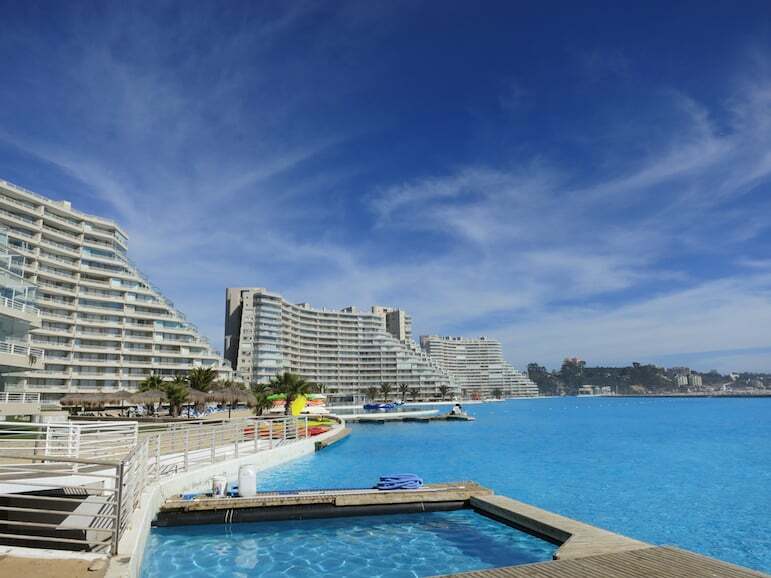 The San Alfonso del Mar is home to the world’s largest swimming pools. It is one kilometre wide and 35 metres (115 ft) deep, making it the deepest pool in the world. And it’s something of a multi-tasker too. Guests can swim, go kayaking or sailing, and as it’s just steps from the beach, it’s perfect if you don’t like swimming in the sea, but enjoy lounging on your own stretch of beach. Experienced a great place for a dip? Share it with us below.